It’s possible to quantify this by sorting jobs into categories: Occupations where at least 25 percent of workers earn less than the proposed minimum wage would be “significantly affected” by the hike. Occupations where half or more of workers earn less would be “highly affected.”1 Assuming wages rise 2 percent per year across the board — a rough estimate, but faster than they have risen in recent years either nationally or in California — then in 2022, about 40 percent of California workers will be in “significantly affected” occupations and 30 percent will be in “highly affected” ones. (Both figures are fairly typical of the U.S. overall.) But as the table below shows, there is huge regional variation. In San Francisco and San Jose, only about 10 to 15 percent of workers are in highly affected occupations. In the San Joaquin Valley area of Visalia-Porterville, that figure is close to 50 percent. It’s true that the U.S. is creating a lot of jobs in fast food, retail and other low-paying sectors. Jobs in the lowest-paying 20 percent of occupations grew by 2.3 percent last year and by 10.6 percent since 2010.2 But high-paying occupations are growing even faster, up 2.7 percent from 2014 to 2015 and 12.5 percent since 2010. 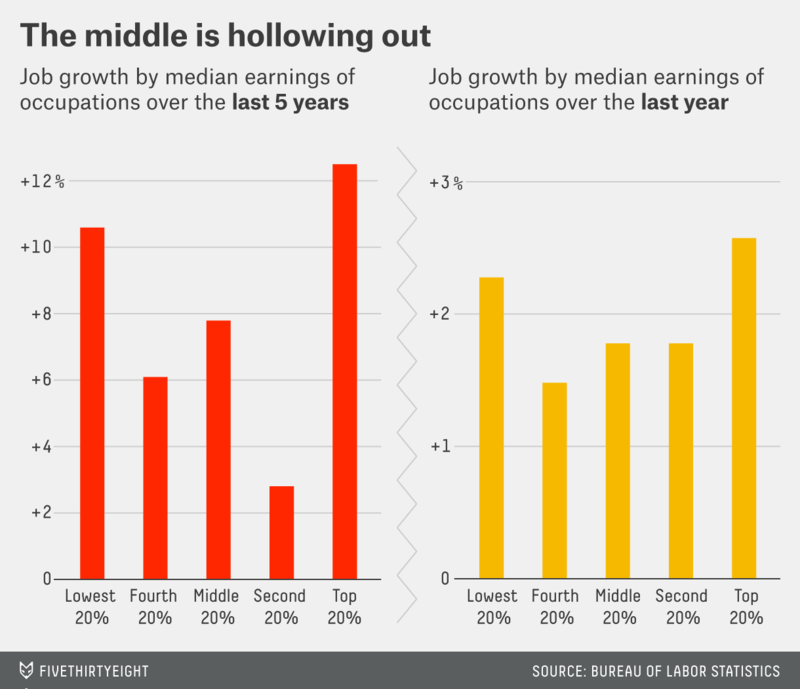 Where jobs are lagging is in the middle, as the chart below shows. This U-shaped job growth has been a persistent pattern in the recovery, and it doesn’t seem to be changing as the job market improves. That suggests it may be the result of longer-term shifts in the U.S. economy, such as automation, outsourcing or the decline of unions.